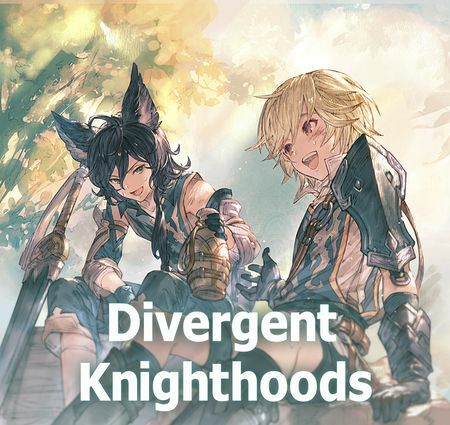 Divergent Knighthoods is a story event. for the royal capital of Feendrache. the impossible—to become knight captain. what sort of future awaits the two in the capital. 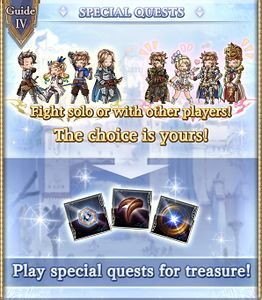 Wyrmsword is a quite useful event SSR weapon for new players - its Sabre type means that a number of notable classes (like Dark Fencer) can use it, and the additional effect from being wielded by the MC is a nice damage boost for Earth grids who don't yet have to worry about damage cap. A recommended pickup for new players. Knight of Knights is a standard event summon and is generally outclassed by other farmable summons. 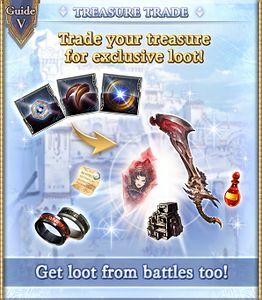 While it has some value for newer players, it's fine being considered a low priority from the Event Shop. Support Skills boost Charge Attack damage for the whole party. Strength: 10% on Charge Attack. 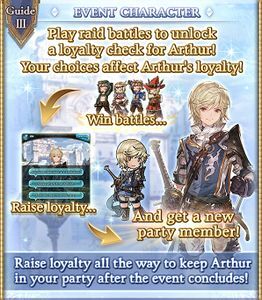 Clearing an event raid battle certain times after having completed the event story will let you play Arthur's loyalty episodes. Talk with Arthur during the loyalty episodes and give the right responses to raise his loyalty. Raise loyalty all the way to keep Arthur in your party after the event concludes! You can also view loyalty episodes via the Journal screen once Arthur has joined you permanently. Additionally, Arthur's loyalty episodes are archived on his lore page. Exam Review, Section I The enemy infantry is approaching yours in a wedge formation. How do you counter? Sneak attack from behind. Surround them with a V formation. Ambush them from the skies! Exam Review, Section II (Captain), what virtue defines a knight? The strength to crush your enemies. You're thinking too hard about this. The courage to protect king and country. Teach Me about Lancelot! What do you think of Captain Lancelot, (Captain)? He's just... cool. He's pretty funny. He's super strong! Teach Me about Percival! Just what are you to each other anyways? Hehe... That's a secret. A loyal vassal. A dear friend. Teach Me about Siegfried! So, please—it doesn't matter what it's about, I just wanna hear more about him! Tell a cute story. Tell a funny anecdote. Tell a valiant tale. Swordcraft Practice (Captain), please practice swordcraft with me! Maybe later. Really? With me? Sure thing! Weight Training Okay... Next are sit-ups! Need me to hold your legs? I'll bring you a towel. Let's do them together! Arthur the Sleepyhead Zzz... Yell loudly. Shake him. Call Mordred. Teach Me about Skyfarers! Say, (Captain)... Why did you decide to become a skyfarer? Why do you think? Because of my father. To get to the Island of the Astrals. 8-hit Earth damage to random allies. ~5000 Earth damage to all allies. All allies gain Oath of the Peach GardenAttack is boosted. Gives a chance to heal at end of each turn. at the start of battle. Also triggers with Arthur in the backline. 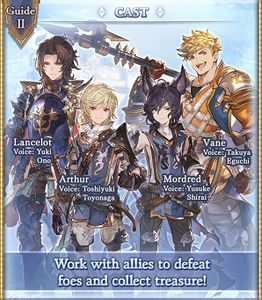 Party: Guests Arthur (Event), Lancelot (Wind), and Vane (SSR). Half Elixir ×2 1 75 10 - - Recommended. Soul Berry ×2 1 100 4 - - Recommended. Oh hey! There’s the capital! Phew, can’t believe we made it on time! But man, what do you think the entrance exam is gonna be like? Hm, I wonder…… easy, I bet! 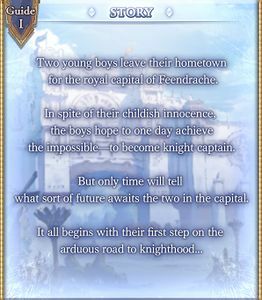 so we can run back home and boast about being knights to everyone at the orphanage, right? You haven’t forgotten our goal in coming here, have you? Of course not! Hey, let’s race the rest of the way to the capital! All right! On your mark, get set — go!! We’re definitely going to become captains!! This page was last modified on 9 November 2018, at 11:25.